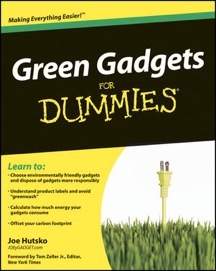 Thanks to Joe Hutsko for recommending our Mac energy saving software in his latest book: Green Gadgets For Dummies. Joe is a prolific writer whose work can regularly be found in major US newspapers and magazines, including the New York Times and Washington Post. Joe's latest book, Green Gadgets For Dummies, recommends Power Manager, Sleep Monitor, and our free Energy Schedule widget to Mac users looking to reduce their energy footprint. You can buy Green Gadgets For Dummies today from Amazon.com. The Amazon.com links on this page are Joe's affiliate links, and they make sure Joe earns that little bit more with each sale. Joe writes about green gadgets for the Green Inc. section of the New York Times, and he has written for numerous publications and websites, including MSNBC.com, TV Guide, The Washington Post, Fortune, Wired and others. This article was posted in Business, Energy saving, and Power Manager and tagged dssw, Energy saving, Green Gadgets for Dummies, and Joe Hutsko.